In a mixing bowl mix condensed milk and coconut flakes well. Press the mixture in a 8×8 inch baking dish. Cut the mixtures into 36 squares. Meanwhile cut almonds into halves or slice them thin if you prefer. 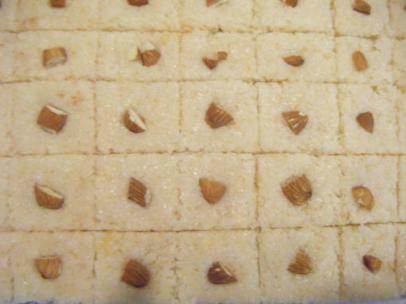 Place almonds halves on the squares.